It was a start. Now after three years, we are proud to publish the continuation of that study with a few changes. First, and foremost, we have more than tripled the number of carcasses studied to 472 – each analyzed by Dr. Keigo Kuchida’s carcass camera and software – which adds significantly to the level of accuracy. And we have added a Fineness Ranking – with interesting results. We hope that the data provided by our rigorous data collection proves helpful to our fellow breeders in bringing the best of this breed to bear. WKS Yasufuku Jr, with 30 images analyzed, has moved up to the top spot in the 2017 sire study from the #2 spot in 2014 (where he had only 9 carcasses). He remained the top dam sire as he was in 2014 (30 images in 2017 vs 13 images in 2014). Most interesting about his numbers is that as a sire, it does not seem to matter the dam sire – Sanjirou, Toshiro, Kitaguni etc: across the board he seemed to boost the marbling by a large margin. But, when Yasufuku Jr is analyzed as dam sire, it is a different story – the vast majority was sired by WKS Kitaguni Jr. It gets more interesting – the data we have collected on Yasufuku is consistent with the results of a study completed by Greg Gibbons* in 2012. The study showed Yasufuku Jr as the leading sire with an average IMF of 40.8%. Yet, strangely enough, BREEDPLAN has assigned him very ordinary EBVs. We do not often quibble with their calculations – matter of fact, this is the one time in recent memory that baffles most breeders who feel that Yasufuku Jr is a mighty force in the Wagyu world. Having said all of that, we are still strong BREEDPLAN supporters – and feel that they are providing a powerful and important service. And we agree wholeheartedly with most all the other results. WKS Kitaguni Jr was formerly the highest ranked sire for IMF% – but it was based on only 9 carcasses. As Yasufuku moved up on all the charts, he simply pushed Kitaguni out of the way. Even with 55 Kitaguni Jr carcasses sired in this year’s study, Yasufuku Jr still outranks everyone else. Importantly, with 11 carcasses as dam sire, Kitaguni Jr shows his power by ranking #2 – outperforming even TF148. 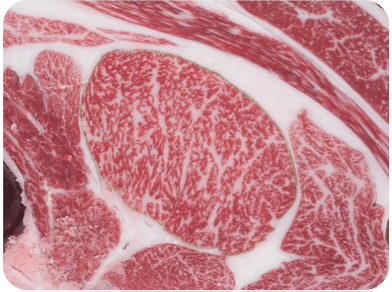 And in terms of Fineness of the marbling, Kitaguni Jr is ranked second – and to those who are breeding for beef, that is an important measurement. The same holds true for his Dam Sire rankings. Contrary to Yasufuku’s details noted above – it does not seem to matter when looking at Sire results, it does not matter who his is bred to nor does it matter who the sire is when looking at the Dam Sire results – he brings it in both cases! We have been pleased to see Kitaguni Jr’s BREEDPLAN numbers climb up and up since submitting our data. A new addition to the study, Fineness Ranking, has just been implemented – and the results are interesting to say the least. The top ranked sire in terms of fineness is a Lone Mountain sire, LMR Akahige 8199U – with LMR Yojimbo ranked fourth. But WKS Yasufuku Jr is the top ranked dam sire followed by a trio of Takeda sires: TF Itomichi 1-2, Itozurudoi TF151 and Itoshigenami TF148. The fineness trait is very important when raising Wagyu for beef – coarse marbling is not what you want to see in the ribeye. And this trait seems to be heritable, though I do not know what that exact number is. We have included the Standard Deviation (STDEV) in both the IMF% and Fineness Ranking tables. STDEV is the average deviation from the mean. The higher the standard deviation number, the more divergent the results are and thus, to an extent, less meaningful. A low STDEV makes for a consistent outcome. *Greg, a senior executive and the breeding and feedlot expert of Wagyu at the Australian Agricultural Company (AACo), was just awarded Honorary Life Membership by the Australian Wagyu Association. Greg, a longtime friend of Lone Mountain, visited Lone Mountain about 10 years ago and subsequently wrote an article about the ranch for the Australian newsletter when he was acting as the editor of the magazine. This study is the sole property of Lone Mountain Cattle Company. Any reproduction of the data should be attributed appropriately. 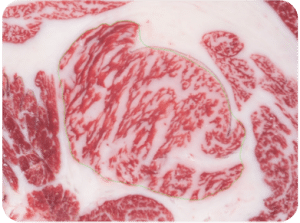 Intramuscular Fat Percentage (IMF%) is the amount of marbling in the ribeye as a percentage of total meat surface area, as measured objectively by Dr. Kuchida’s Carcass Camera. Standard Deviation (STDEV) indicates the amount to which the samples deviate from the average IMF% – thus, a smaller STDEV indicates the IMF% of samples of a sire are closer to that average IMF%. Sires with 5 or fewer samples are omitted. Marble Fineness EBV (Marbling Fineness Index) is an estimate of the genetic difference in the Marbling Fineness Index (degree of fineness of marbling fat) as measured by the Japanese digital image camera. Sires with higher EBVs are expected to produce progeny with higher levels of marbling fineness. Not only does the camera identify traits that hold economic importance, it also measures traits such as fineness / coarseness of marbling that can influence greatly the value of the carcass which is depicted below in the two images. The focus of this trait has been of particular interest to the Japanese and is now increasingly being identified as animportant characteristic to those countries producing Wagyu outside Japan. We here at Lone Mountain evaluate and assess the Fineness Values of our genetics in our breeding program and whole heartily believe the eating quality attributes (texture, flavor, juiciness and palatability) of Wagyu beef is highly correlated. As such, we incorporate both the raw and the calculated observations in our carcass assessment. 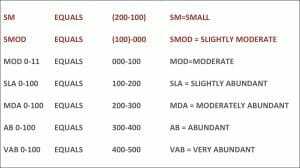 Below is a table of our slaughter data illustrating the phenotypic or “raw” fineness value (as determined by the Beef Analyzer II software) of the Sires used in the Lone Mountain meat program. Affixed by USDA reps at the time of fabrication, Ribeye Eye Muscle Area (REA) is a measure of ribeye size, and thus, the greater the REA, the greater the yield of meat. 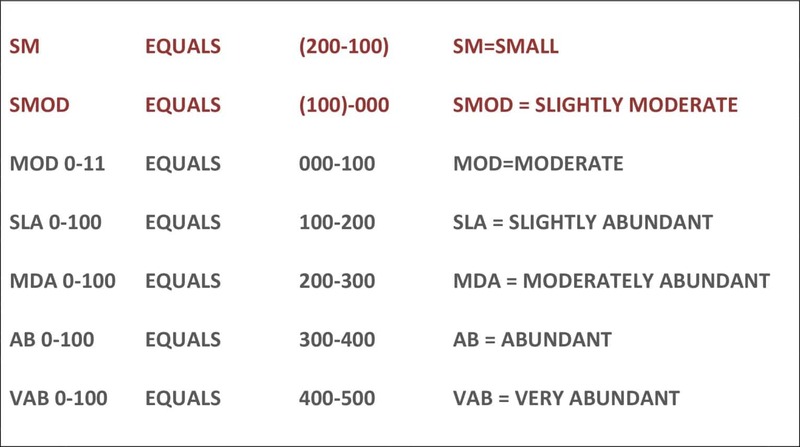 Affixed by USDA reps at the time of fabrication, USDA (marbling) Grading Scores range from SM (Small) to VAB (Very Abundant), with ranges in each quality from 0-100 The full breakdown of potential USDA Scores follows, and for purposes of averaging, we have transposed these USDA scores to numbers.